As host to the 2013 NCAA® Men’s Final Four®, the second most popular sporting event across the globe, Atlanta was center stage in the world's sports arena April 5 - 8 . Over 100,000 people celebrated the 75th March Madness in downtown Atlanta at the games, concerts and events hosted in conjunction with the Final Four. The games were played at the Georgia Dome. 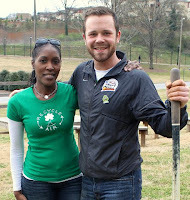 One of the Atlanta Local Organizing Committee stated goals was to make the 2013 Final Four the "greenest games ever." A veteran to sustainability initiatives, the Georgia Dome - one of three facilities under the Georgia World Congress Center Authority umbrella - is the Sustainable Food Court Initiative Event Venue Pilot. Sister facilities include Centennial Olympic Park and the Georgia World Congress Center, the nation's fourth largest convention center. The GWCCA hosted the 2009 acclaimed Zero Waste Zones press conference launching the groundbreaking program. In July, 2012 a sustainability committee comprised of civic and community leaders was formed. Tim Trefzer - GWCCA campus director of sustainability - chaired the ALOC sustainability committee and took the helm to achieving the "greenest games ever" goal. The ZWA Blog post, Green Footprints Before, During and After the Games, is a preview of the committee's green games plan. 14,351 lbs. of electronics were collected for recycling from the community. 213 volunteers completed a green pledge committing to at least ten actions to be more sustainable during the Final Four. 500 lbs. of textiles were collected for reuse at the City of Refuge and|or recycled by American Textiles Recycling Services. 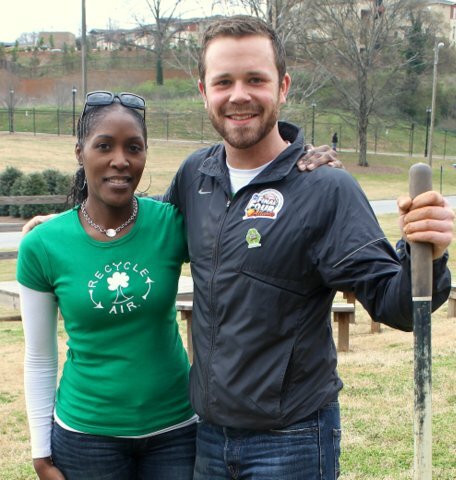 75 trees were planted in honor of the 75th celebration of March Madness in conjunction with Trees Atlanta and the Captain Planet Foundation. Recycling in-place at primary venues including the "big six hotels," The World of Coca-Cola, and Philips Arena was verified by committee members. Green-certified renewable energy credits (RECs) were purchased from Sterling Planet to offset the electricity (119,000 kilowatt-hours) used during the three games held at the Georgia Dome and the Divisions II and III championship games held at Philips Arena, as well as carbon associated with the eight teams traveling to Atlanta (128 metric tons). 33.54 tons of recyclables were collected along the primary pedestrian routes downtown and from the GA Dome, GWCC and Olympic Park. Final Four tickets were made with recycled content PVC and for the first time paperless tickets were offered. The Final Four court floor was made of Forest Stewardship Council -certified wood and will be reused, repurposed, or recycled after the event. Lanyards worn by volunteers were made of recycled content. A minimum of 1,000 tote bags will be made from vinyl banners collected from the Georgia Dome and the street poles throughout Atlanta after the events concluded. 75 trees will continue to thrive in a downtown Atlanta neighborhood and two city elementary schools. 200 recycling containers donated by the City of Atlanta for the primary pedestrian routes downtown are available for future events. Camaraderie among the committee members upon executing a well-organized plan for achieving "greenest games ever" status. For in-depth details on the above recap, the Final Four Sustainability Report is available for download on the Elemental Impact Resources page under the Event Recycling section. Comparisons to prior years along with recommendations for future Final Four hosting cities is included in the comprehensive report. Thanks to Tim Trefzer's stellar leadership, the ALOC sustainability committee executed a well-organized plan with near perfection that is documented as a template for others to follow. YES, the 2013 Final Four Games held in Atlanta were "the greenest games ever!"